K lies asleep peacefully, intubated and on painkillers after her PEG and fundoplication procedure as I am typing this beside her bed. She has her bedside buddies with her. All in good hands as you can see. We checked in yesterday into the high dependency ward. She had quite a number of pricks for blood and to do the IV plug. They needed quite a bit of blood. After the pricks, blood was enough but no iv plug as they couldn’t find the veins. Quite a bad afternoon for her. They gave up on the IV plug. Opting to do that after she goes to sleep for her surgery. Her procedure took about 4 hours. At the 3 hour mark, the doctor called us up. We were a little taken back as for these times in hospital, usually no news is good news. We sighed a relief as the surgeon explained to us about the hernia they discovered. We said ok to suturing it up to prevent any complication in future. 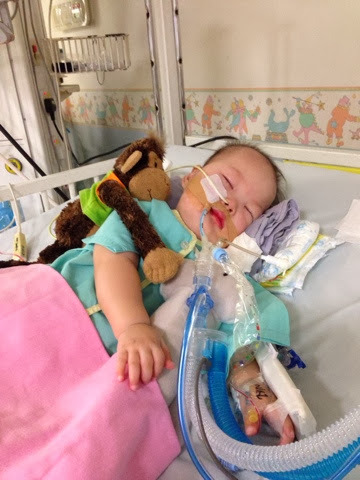 We went to the ICU to receive her as she would be there for the time being for observation. She came out of the OT with her BiPap mask on, which is a surprise as we expected her to be intubated. But as soon as she went into the ICU, she desat and they decided to put her back on intubation. I am glad she is able to sleep and rest. She did open her eyes for few moments as and when but went back to sleep soon. Next step would be to get her back on room air and extubate the next day. I thank and appreciated everybody’s prayers and well wishes.